This site is intended as an information guide only. Always seek the advise of a qualified veterinarian. The information contained in this website is not to be interpreted as a diagnosis or replacement for proper veterinary care. In mild episodes of obstruction, short-acting steroids, oxygen therapy, and cooling the dog while it calms down may be sufficient. Bear in mind that sedation without intubation will relax upper airway muscles and may increase obstruction, and that hyperthermia may develop in an oygen tent or cage and exacerbate the problem. KCS or "dryeye" is an eye disease caused by abnormal tear production. The lacrimal glands produce the watery secretions that make up the bulk of the tears. A deficiency in this secretion causes KCS in small animals. Normal tears are essential for the health and transparency of the cornea (the surface of the eye). Tears cleanse and lubricate the cornea, carry nutrients, and play a role in the control of infection and in healing. Deficient tear production as in KCS causes chronic irritation of the cornea and conjunctiva. Corneal ulcers and eventually corneal scarring occur, and blindness can result. There is a predisposition to this condition in some breeds as listed below. KCS can also occur in any breed as a result of viral infection, inflammation, drug-related toxicity, or immune-mediated disease. There is an association between removal of a prolapsed nictitans gland ("cherry eye") and the development of KCS. The mode of inheritance is not known. What breeds are affected by KCS? Congenital KCS (ie. the dog is born with the condition) is rare. It may be one-sided and has been seen in toy breeds such as the Yorkshire terrier, pug, Pekingese, and Chihuahua. These dogs have very small or absent tear-producing (lacrimal) glands. What does KCS mean to your dog & you? KCS may develop very quickly or more slowly, in one or both eyes. Commonly it is diagnosed in 1 eye first and develops in the other eye within several months. The extent of discomfort depends on the severity of the tear deficiency and how long it has been present. People with KCS say it feels like they have sand paper under their eyelids with every blink. Dogs show their discomfort by rubbing their eyes, squinting, and being sensitive to light. Your dog's eye(s) may be reddened and inflamed, or the cornea may appear dull and dry. There is commonly a thick mucousy discharge in the eye or in the area around the eye. Problems associated with KCS include chronic or recurring irritation or infection of the conjunctiva and cornea, and corneal ulcers. These conditions are painful and, if KCS is untreated, over the long term the normally transparent cornea becomes thickened and scarred. Blood vessels and pigmented cells move in to the cornea because of the chronic inflammation, and blindness may result. Your veterinarian may suspect KCS based on the kinds of clinical signs mentioned above, particularly in a breed with a predisposition to this disorder. KCS is confirmed by measuring your dog's tear production. Your veterinarian will also perform a fluoroscein dye test to check for corneal ulceration. FOR THE VETERINARIAN: A Schirmer tear test (STT) should be performed before the use of any drops or ointments in any dog presenting with ocular discharge, irritation, or corneal lesions. Normal STT values in the dog are 15 to 25 mm/minute. Dogs with exposed corneas due to conformation require relatively more tears so may show KCS even with marginal deficiencies. The goals of treatment are to restore moisture to the eye and to treat conditions such as infection or ulceration that develop because of the lack of normal tears. Tear stimulants and artificial tear replacements are used to treat KCS. Generally it will take a period of trial-and-error for your veterinarian to determine what is best for your dog. A response to tear stimulants may not occur for a few weeks or even longer, and during this time artificial tears must be used as well. Once tear production has been established, often the use of a tear stimulant once daily, or sometimes once every 2 days, will be sufficient to control KCS. It is important to recognize that this treatment is not a cure for KCS but rather a way to manage a frustrating, painful, and potentially blinding condition. Clinical signs will slowly return If treatment is stopped. When medical therapy as outlined above is unsuccessful, surgery can be done to transport one of the salivary ducts to provide moisture to the eye. This is generally less satisfactory. FOR THE VETERINARIAN: Cyclosporine is the treatment of choice due to its efficiency at stimulating tear production, the need for fewer applications, and the lack of undesirable side effects with long term use. The time required to achieve sufficient tear production varies; usually a response is seen within a few weeks but several weeks may be required. Artificial tears should be supplied until tear production is established. How is retinal dysplasia inherited? What breeds are affected by retinal dysplasia? Breeds most commonly affected with the detached or geographic form of this condition include the American cocker spaniel, Bedlington terrier, English springer spaniel, golden retriever, Labrador retriever, Sealyham terrier, and Yorkshire terrier. Retinal dysplasia has been seen in many other breeds as well, including the akita (folds,geographic/detachment), Australian shepherd (folds), beagle (folds), Belgian malinois (folds), border terrier (folds), bull mastiff (folds), Cairn terrier (multifocal folds, geographic), cavalier King Charles spaniel (folds and geographic/detached), clumber spaniel (folds), collie (folds), field spaniel (folds), German shepherd (folds), Gordon setter (folds), mastiff (folds), Norwegian elkhound (folds), old English sheepdog (folds), Pembroke Welsh corgi (folds and geographic/detached), rottweiler (folds), samoyed (folds,geographic/detached), soft-coated wheaten terrier (folds), Sussex spaniel (folds). Labrador retrievers and samoyeds with retinal dysplasia may also have a bony abnormality called chondrodysplasia, or dwarfism. The dog's front legs are shorter and thicker than normal. 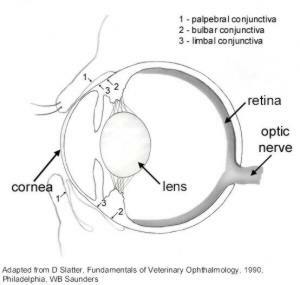 What does retinal dysplasia mean to your dog & you? How is retinal dysplasia diagnosed? How is retinal dysplasia treated? The trait for deafness is tied to the genetics of coat colour, particularly in breeds with the merle or piebald gene. There is an increased risk of deafness with increasing amounts of white in the coat. The mode of inheritance in dalmatians is thought to be autosomal recessive involving more than 1 gene (or incomplete penetrance may be involved), since dogs with normal hearing in both ears can produce bilaterally deaf puppies, and vice versa. Dogs with deafness in 1 ear can have pups that are deaf in both or neither. Statistically however, deaf parents are more likely to produce deaf pups. Dogs with an increased amount of white in their coats and blue eyes (discussed further below) are predisposed to congenital deafness. In breeds in which deafness is associated with merle colour, the trait appears to be autosomal dominant. In the bull terrier, Doberman pinscher, pointer and rottweiler, congenital deafness is thought to be an autosomal recessive trait. What breeds are affected by deafness? Deafness occurs in many breeds. The highest incidence is in the dalmatian, with studies from the US and the UK showing that 18 to 30% are unilaterally deaf, and 5 to 10% are bilaterally deaf. The condition is slightly more common in female dalmatians. Other breeds with a relatively high incidence of deafness are the English setter, Australian shepherd, border collie and Shetland sheepdog. There is a strong association of deafness with increased amounts of white colour in the coat and blue eyes (heterochromia iridis) in breeds with merle and piebald coat colouring. Merled breeds include the merled collie and Shetland sheepdog, Australian heeler, dapple dachshund (18% bilaterally deaf, 36% unilaterally deaf), harlequin great Dane, Norwegian dunkerhound, and old English sheepdog. Breeds with the piebald gene (which affects the amount and distribution of white areas) include the beagle, bull terrier, samoyed, great Pyrenees, Sealyham terrier, greyhound, English bulldog, English setter, and of course dalmatian. Congenital deafness is reported less commonly in many other breeds including the akita, cocker spaniel, Staffordshire terrier, Boston terrier, boxer, Catahoula leopard dog, Doberman pinscher, dogo Argentina, English springer spaniel, foxhound, German shepherd, greyhound, Jack Russell terrier, Kuvasz, Maltese terrier, miniature pinscher, miniature and toy poodle, papillon, Rhodesian ridgeback, rottweiler, St. Bernard, Scottish terrier, Shropshire terrier, Siberian husky, Walker American foxhound, West Highland white terrier, whippet. What does deafness mean to your dog & you? Ackerman, L. 1999. The Genetic Condition: A Guide to Health Problems in Purebred Dogs. pp 132-133. AAHA Press. Lakewood, Colorado. This reference has a good explanation of the heredity of the deafness trait and the association with merle and piebald coat colours. This database is funded jointly by the Sir James Dunn Animal Welfare Centre at the Atlantic Veterinary College, University of Prince Edward Island, and the Canadian Veterinary Medical Association. As part of normal circulation in the body, the right side of the heart (the right ventricle) pumps blood to the lungs to receive oxygen. The oxygenated blood goes back to the left side of the heart from which it is pumped out to the rest of the body. Blood flows from the right ventricle of the heart through the pulmonic valve into the pulmonary artery and thence to the lungs. With pulmonic stenosis, there is partial obstruction of normal blood flow, most commonly due to a malformation of the pulmonic valve ("pulmonic valve dysplasia") but the abnormality may be immediately above or below the valve as well. The effect of this partial obstruction is to force the heart to work harder to pump blood to the lungs. The extent to which a dog will be affected depends on the degree of narrowing (stenosis) of the valve area. With severe stenosis the dog will likely develop congestive heart failure due to the increased workload of the heart. How is pulmonic stenosis inherited? Pulmonic stenosis appears to be a polygenic threshold trait. What breeds are affected by pulmonic stenosis? The English bulldog and the mastiff are at most risk for pulmonic stenosis. In English bulldogs, pulmonic stenosis occurs commonly with an abnormal left main coronary artery branch, arising from a single right coronary artery. In this breed the condition is more common in males. There is also an increased risk of pulmonic stenosis in the beagle, wire-haired fox terrier, chihuahua, miniature schnauzer, samoyed, Boykin spaniel, West Highland white terrier, cocker spaniel, Airedale terrier, and Scottish terrier. What does pulmonic stenosis mean to your dog & you? In its milder forms, the slight thickening of the pulmonary valve will cause minimal or no obstruction and your dog will not be affected. However with more severe thickening of the valve, the obstruction to blood flow from the right side of the heart will cause varying degrees of heart damage which worsens with age. With moderate-to-severe pulmonic stenosis, your dog may experience signs associated with low cardiac output and/or right-sided heart failure, such as respiratory difficulties, fainting, tiring with exercise, abnormal cardiac rhythms, abdominal swelling due to an enlarged liver or the accumulation of fluid because of failing circulation, or sudden death. Based on your dog's physical examination and diagnostic tests such as chest x-rays and an electrocardiogram, your veterinarian will discuss with you the severity of the pulmonic stenosis. If there are significant changes evident, he or she will suggest further tests to determine the pressure gradient across the pulmonic valve. (Normally there is no pressure difference between the right ventricle of the heart, and the pulmonary artery to the lungs.) Where there is a pronounced pressure gradient, surgery to correct the stenosis should be considered. How is pulmonic stenosis diagnosed? The first indication that your dog has a problem may be when your veterinarian hears a heart murmur on an early physical examination. Alternately, you may see signs in your dog related to heart disease, such as fainting or fatigue with exercise. Your veterinarian will listen carefully to try to determine the location of the murmur and to differentiate it from an "innocent" murmur which disappears by about 6 months of age. If the murmur is significant, your veterinarian will suggest further tests such as a chest x-ray, electrocardiogram, and cardiac ultrasound to help determine the cause, and to see what changes if any have already occurred in the heart as a result of the defect. Once pulmonic stenosis has been diagnosed, Doppler echocardiography or cardiac catheterization can be done to measure the pressure gradient between the right ventricle and the pulmonary artery, to determine the severity of the obstruction. Based on these test results your veterinarian will discuss with you the long term prognosis for your dog and whether surgical correction of the defect should be considered. MURMUR: systolic ejection murmur, loudest in pulmonic area near left cranial sternal border, often equally loud along right cranial sternal border. ELECTROCARDIOGRAM: RV hypertrophy and right axis shift, right atrial enlargement, possibly arrhythmia associated with hypertrophy. RADIOGRAPHS: right ventricular hypertrophy , poststenotic dilation of pulmonary artery with distal pulmonary vessels reduced in size. ECHOCARDIOGRAPHY: primary means of diagnosis of pulmonic stenosis, typically see mild to moderate right atrial dilation, concentric RV hypertrophy, deformity and narrowing in the pulmonic valve region, and poststenotic dilation of the pulmonary artery. jugular pulses may be evident. In English bulldogs, pulmonic stenosis is commonly associated with a left coronary artery anomaly which has important implications for surgical correction. How is pulmonic stenosis treated? With mild-to-moderate stenosis, your veterinarian will monitor your dog. No other treatment is necessary unless clinical signs develop which are associated with heart disease. Surgery is an option in dogs with moderate-to-severe pulmonic stenosis, with different techniques recommended depending on the site of the stenosis. Because of the expertise and technical equipment required and the surgical risk involved, surgery to correct pulmonic stenosis is generally performed in a referral centre. Surgery is more risky if atrial fibrillation or congestive heart failure have developed. These conditions should be treated medically and the dog stabilized before surgery is considered. Medical management for congestive heart failure is similar no matter what the cause, and consists of medications to support the heart muscle and decrease the work load of the heart, together with dietary recommendations. Bussardori, C. 1998. Breed related echocardiographic prognostic indicators in pulmonic and subaortic stenosis. ACVIM-Proceedings of the 16th Annual Veterinary Medical Forum: 140-142. Bonagura, J.D. and Darke, P.G.G. 1995. Congenital heart disease. In S.J. Ettinger and E.C. Feldman (eds. )Textbook of Veterinary Internal Medicine, p. 892-943. W.B. Saunders, Toronto. Patterson, D.F. 1996. The genetics of canine congenital heart disease. ACVIM-Proceedings of the 14th Annual Veterinary Medical Forum: 225-226. This reference has good information for breeders and veterinarians regarding screening and genetic counselling for congenital heart defects. Thomas, W.P. 1995. Therapy of congenital pulmonic stenosis. In J.D. Bonagura and R.W. Kirk (eds.) Kirk's Current Veterinary Therapy XII Small Animal Practice, p. 817-821. W.B. Saunders, Toronto. What is a ventricular septal defect (VSD) ? A ventricular septal defect is a hole (or defect) in the muscular wall of the heart (the septum) that separates the right and left ventricles. Before birth, the heart starts out as a single tube which gradually differentiates into 4 chambers during embryological development. Abnormalities can arise at several steps in the process, resulting in defects in the muscular walls that normally separate the heart into the right and left atria, and the right and left ventricles. The result is abnormal blood flow in the heart with varying effects in the dog, depending on the size and location of the defect. In the English bulldog and keeshond, inheritance is autosomal recessive, with variable expression. What breeds are affected by VSDs? This disorder occurs sporadically in many breeds. The English bulldog and keeshond are at increased risk for VSD. In either breed, a VSD may be part of the disorder Tetralogy of Fallot. What does a ventricular septal defect mean to your dog & you? The extent to which your dog will be affected depends on the size and location of the defect within the ventricular wall. Many dogs have small defects which may spontaneously close. With such defects there will no or very minor clinical effects. With larger defects, because of higher pressure in the left side of the heart, there will be a left-to-right blood flow across the defect. This means that the left side of the heart must work harder and that there will be extra blood circulated to the lungs, creating an abnormal load on them. Conditions that increase pressure in the right side of the heart (such as pulmonary hypertension) may result in a right-to-left shunt, also called a reverse shunt. Signs associated with this disorder may develop within months or years, depending on the significance of the defect, and include shortness of breath, exercise intolerance, sudden death due to an abnormal heart rhythm, or, with a reverse shunt, cyanosis (grey instead of pink mucous membranes). Your veterinarian will monitor your dog's progress and recommend treatment as required. This may include medications to support the heart and to reduce congestion in the lungs, a special diet, exercise restriction, and precautionary antibiotic therapy before procedures such as dentistry. Among puppies with large VSDs, it is probable that many die early, before 8 weeks of age or before they are examined by a veterinarian. Often, as with most heart defects, the first indication of a problem is when your veterinarian hears a heart murmur on your pup's physical examination. Sometimes there is exercise intolerance or respiratory difficulty, but this is usually in an older dog or a young pup with a large defect where congestive heart failure has already developed. Some low-grade murmurs are "innocent" and disappear by 6 months of age, but if the murmur is significant, your veterinarian will suggest a diagnostic workup to determine the cause. S/he will listen very carefully to your dog's heart to determine where the murmur is loudest and when it occurs during the cardiac cycle. Other diagnostic aids include chest x-rays and an electrocardiogram (ECG). Echocardiography (an ultrasound) is generally required to determine the location and severity of a ventricular septal defect. Based on the results of these various tests, your veterinarian will discuss with you the prognosis and long term management of your pet. S/he will also be able to tell you whether any detectable change has occurred in the heart already as a result of the defect. MURMUR: harsh regurgitant holosystolic murmur, loudest in right intercostal spaces 2 to 4; also can often be heard cranially on left thorax. ELECTROCARDIOGRAM: normal or LV enlargement (with larger shunts); may develop right bundle branch block; may indicate right-sided enlargement if right-to-left shunt develops. RADIOGRAPHS: normal or left-sided enlargement; with larger shunts, increased prominence of pulmonary vasculature; right-sided enlargement if right-to-left shunt develops. OTHER: Clinical signs usually don't occur unless the pulmonary volume is more than 2 to 3 times normal. Most commonly, signs associated with a left-to-right shunt and left-sided heart failure are seen. Where secondary obstructive pulmonary vascular disease develops, so that pulmonary resistance exceeds that of the systemic vasculature, a right-to-left shunt develops (Eisenmenger's physiology). This is associated with cyanosis and polycythemia and has a very poor prognosis. Signs associated with heart disease are treated when and if they develop. Treatments include medications to support the heart and to reduce pulmonary congestion, a special diet, exercise restriction, and precautionary antibiotic therapy before procedures such as dentistry. There are 2 current surgical options available. Where a significant defect has been identified, but before right-to-left shunting has developed, pulmonary artery banding can be done to decrease the blood flow across the defect, thereby reducing the overload on the lungs and the left heart. Another procedure involves actual repair of the defect, but this requires open heart surgery and carries a high risk. How is aortic stenosis inherited? In Newfoundlands, this defect has been shown to have an autosomal dominant mode of inheritance, with variable expression. In the mildest form, the condition is undetectable and will not cause any problems for the dog. However the defect may still be passed on to offspring. The challenge for breeders and veterinarians is to identify affected dogs with very mild or no clinical signs of the disorder. What breeds are affected by aortic stenosis? Congenital aortic stenosis is probably the most common heart defect seen in large breed dogs. Newfoundland dogs have the highest risk for this disorder. It is also important in the golden retriever, Rottweiler, and boxer. There is a mildly increased risk of aortic stenosis in the German shepherd, German short-haired pointer, Great Dane,samoyed and bulldog. What does aortic stenosis mean to your dog and you? Dogs with mild stenosis will generally show no clinical effects and have a normal life expectancy. With moderate to severe stenosis, signs will be variable. Because of the narrowing in the aorta as the blood leaves the left ventricle, your dog's heart must work harder to pump an adequate volume of blood to the rest of the body. Depending on the degree of obstruction, your dog's heart may be able to compensate at rest but not keep up with the body's demands during exercise. Thus you may see reduced exercise tolerance - your dog just seems to run out of steam - or fainting due to inadequate blood supply to the brain. In response to the obstruction to blood flow, the heart muscle becomes thicker over time (left ventricular hypertrophy). As the condition progresses, your dog's heart becomes less able to compensate and you and your veterinarian may see signs associated with left-sided heart failure such as tiring on exercise, difficulty in breathing, coughing, and/or poor growth. Changes in the heart muscle can also lead to abnormal heart rhythms (cardiac arrythmias) and sudden death. Your veterinarian can do various tests (see below) to determine the severity of the defect. Based on the results, he or she will discuss with you the long-term prognosis, and ways to manage this condition in your dog. In young animals (less than 6 months of age) there may be no clinical signs. Thus the first indication that your dog may have a problem may come when your veterinarian hears a heart murmur during physical examination. Some low-grade murmurs are "innocent" and disappear by 6 months of age, but if the murmur is significant, your veterinarian will suggest a diagnostic workup to determine the cause. He or she will listen very carefully to your dog's heart to determine the point of maximal intensity of the murmur and when the murmur occurs during the cardiac cycle. Other diagnostic aids include chest x-rays, an electrocardiogram (ECG) and/or ultrasonography if available. To determine the extent of the narrowing, the pressure gradient across the aortic valve (between the left ventricle and the aorta) can be measured using special procedures for which your veterinarian can refer your dog to a specialist. In an older animal or when the obstruction is pronounced there may be clinical signs associated with left-sided heart failure. Based on the results of these various tests, your veterinarian will discuss with you the prognosis and long term management of your pet. S/he will also be able to tell you if any (and how much) change has occurred in the heart already as a result of the stenosis. MURMUR: systolic, left hemithorax, radiates into thoracic inlet and up the neck, PMI left heart base (3rd to 4th intercostal space), may be equally loud at right heart base. RADIOGRAPHS: may see left ventricular enlargement, cranial aortic enlargement, left axis shift. Pulmonary vasculature is normal. The arterial pulse may be of reduced intensity and slow to rise. Echocardiography (with Doppler) or cardiac catheterization is usually required to determine the severity of the defect. In dogs with mild aortic stenosis,there is no special treatment required. The dog should not be used for breeding and littermates should be carefully screened. Your veterinarian may suggest antibiotics in certain circumstances as a precaution against infection of the abnormal valve tissue. With moderate to severe stenosis, the dog's exercise should be restricted. Beta-blocking drugs may be prescribed by your veterinarian to try to minimize the effects of left ventricular hypertrophy. Your veterinarian will recommend other therapy if required to manage congestive heart failure. Medical management for congestive heart failure is similar no matter what the cause, and consists of medications to support the heart muscle and decrease the work load of the heart, together with dietary recommendations. Various surgeries have been attempted to alleviate the obstruction with limited success. The surgery itself carries a high risk, and there is little, if any, increase in survival rates compared with dogs whose condition is managed medically. Demodex canis is a mite that is present in small numbers in the skin of most healthy dogs. Nursing puppies acquire the mite from their mothers during the first few days of life, and in most dogs there will never be any associated problems. In some dogs however, the normal balance is disrupted due to an immune defect. The mites multiply by the thousands in the hair follicles causing inflammation, in a condition called demodicosis. Demodicosis may be localized - that is, confined to 1 or more small discrete scaly reddened areas of hair loss, most commonly on the face or front legs. This is usually seen in pups of 3 to 6 months of age, and most cases resolve spontaneously. Alternately, generalized demodicosis may develop, at anywhere from 3 to 12 months of age. This is a severe skin condition. The defect in the cell-mediated immune system which allows the development of generalized demodicosis is believed to be inherited. What breeds are affected by demodicosis? This condition is common in the Chinese shar pei. There is also an increased incidence of demodicosis in the Afghan hound, beagle, Boston terrier, boxer, bull terrier, chihuahua, collie, dachshund, dalmatian, Doberman pinscher, English bulldog, English pointer, German shepherd, Great Dane, Old English sheepdog, pit bull, pug, rottweiler, Staffordshire terrier. What does demodicosis mean to your dog & you? It is important to note that demodicosis is not infectious, to other pets or to people. The mite is present in small numbers in the skin of healthy dogs, but the condition of demodicosis only develops in some animals, who are believed to have a defect in their immune system. Demodicosis may be localized - a mild disorder confined to 1 or more small scaly reddened areas of hair loss, most commonly on the face or front legs. This is usually seen in pups of 3 to 6 months of age, and most cases resolve spontaneously. Generalized demodicosis on the other hand can be one of the most severe skin diseases in dogs. It starts out with local lesions that instead of disappearing, get worse and spread, generally on the head, legs and body. Secondary infections of the hair follicles occur, and large scaly crusted patches form which may eventually cover most of the dog. The deep skin infections can be complicated by resistant bacteria. Some dogs only develop demodicosis on the feet (demodectic pododermatitis). These lesions commonly become infected, are painful, and can be quite difficult to treat successfully. Your veterinarian will do a simple procedure called a skin scraping to find the mites on your dog's skin. In the shar pei, because of the thick skin, a skin biopsy is often needed to make the diagnosis. This is a simple procedure done with local anesthetic, in which your veterinarian removes a small sample of your dog's skin for examination by a veterinary pathologist. For the veterinarian: A skin scraping for demodectic mites should be done in all skin diseases of the feet, pyodermas, and seborrheas. Remember that an occasional adult mite seen on skin scraping is consistent with normal skin. Over 50% of dogs with generalized demodicosis have a normocytic, normochromic, nonresponsive anemia, consistent with chronic infection. Many also have low thyroid hormone levels but they are not hypothyroid. Localized demodicosis: This is a mild disease that usually heals on its on within a few weeks, with or without treatment. Your veterinarian may suggest a mild parasitidal ointment or lotion to rub on the affected area. Whether or not your veterinarian recommends treatment, s/he will want to recheck your dog in about 4 weeks to make sure that the condition is not spreading. Generalized demodicosis: In most cases this serious disease can be treated successfully. Treatment can be lengthy and expensive but the majority of dogs recover completely. In most of the rest, the disorder can be well-controlled with monthly treatment. Most dogs recover after 4 to 8 treatments at bi-weekly intervals. Treatment for generalized demodicosis consists of clipping the dog's entire hair coat to allow better contact of the medication with the skin, removal of all crusts (which may require sedation or anesthesia depending on the extent), bathing with medicated shampoo to kill bacteria and remove debris, and application of a solution called Amitraz (Mitaban) to kill the mites. This regimen works in the majority of dogs. Another option is a course of oral medication, given daily for several months. Underlying skin infections and seborrhea (scaliness) must also be treated. For the veterinarian: In comparison to the initial scraping, a recheck skin scraping should reveal fewer mites, and fewer immature forms. If the lesions are spreading, there are more mites, and the ratio of immature forms to adults is high, than the dog should be treated for generalized demodicosis. Regional or generalized lymphadenopathy is another indicator of generalized demodicosis. See references below for detailed discussion of treatment, including of refractory cases. Scott, D.W., Miller, W.H., Griffin, C.E. 1995. Muller and Kirk's Small Animal Dermatology. pp 417-432. W.B. Saunders Co., Toronto. The Health Committee and BCA have no formal recommendation at this time on how breeders use results of tests to select breeding stock or make breeding decisions, BUT in keeping with the spirit of the BCA being the stewards of the bulldog breed, members are encouraged to take advantage of advances in testing, genetics and medical science to always strive to produce the soundest animals possible with the goal of continuously improving the genetic health of the breed as a whole.